This year the Digital Humanities Centre has invested in some new equipment which we will be revealing here on Digital Dialogues over the coming weeks. One of the new arrivals that we are excited about is the Heritage Digital Activity Pack, otherwise known as the HDAP. The HDAP is available to all Arts students, its is to be used for research, study, coursework and projects. Its portability makes it ideal to be taken out on field trips and digitally capture – visual or audio material. The stylish crumple bag (in black or blue!) comes with a separate inner bag which has movable compartments, and both inner and outer bag can be kitted out with the equipment that best suits your requirements. Tablets – we have iPads or Samsung Galaxy Tablet 10.1. Charged power packs – so you don’t run out of battery out in the field. USB Headphones with microphone you can use skype at any time or listen to content in noisy environments. Joby Tripods. These have super flexible legs which can be easily moulded to any shape, so you can secure the tab anywhere and use it to- for instance – film or view content. USB Samson Meteorite Microphones. 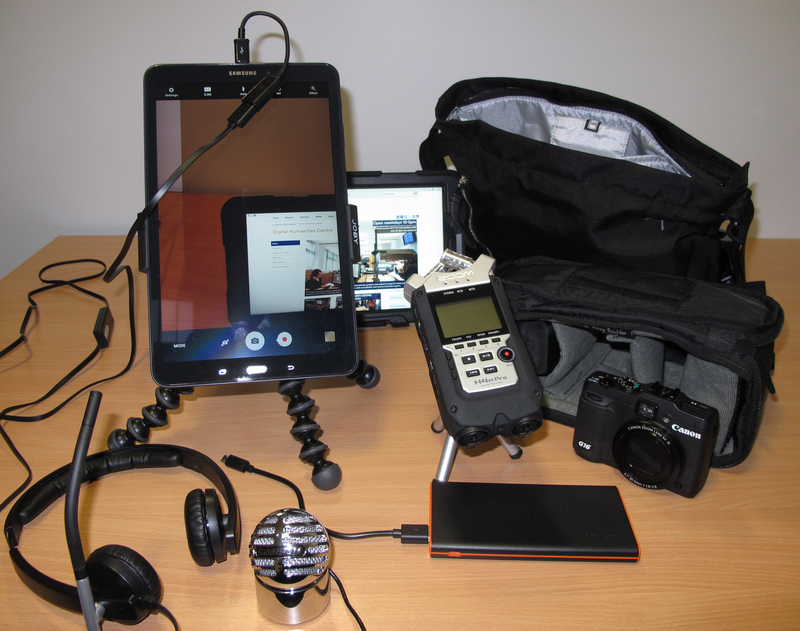 The microphones are easily portable, and use vocal recognition to record high quality sound whether they are being used to record music, podcasts or they are out in the field. They give you further options to the tablet’s built in mic. USB Cameras. Can be used with the tablet to give you more flexibility and higher quality or will attach easily to your own computers and laptops, taking clear pictures and videos. NFC Tags. Near Field Communication microchips are part of the progressive wireless technology trend. The same type of chips that are used in travel cards, or even University student cards, they can be coded with information that can be passed quickly and easily from the chip to a phone or any other Smart reader. You don’t need any coding skills to do this, you simply need to download the app (NFC Tools) onto your smartphone. Flip HD Video Camera. Flip Video Cameras are small and portable cameras that can be held within the palm of a hand to record high quality videos with ease. More portable than an iPad, these cameras are an excellent extra option when it comes to recording data. Canon G11 & G16 Canon DSLR camera. These DSLR cameras are an excellent option for any field trip. They provide high resolution images and can be used on auto or manual settings, and are practical and easy to use no matter what your level of photography skills. Zoom Digital Audio Recorder. Perfect for recording interviews, meetings or talks, more reliable than an iPhone, the Zoom Digital Audio Recorder is a small but stereo quality recorder. These audio recorders will ensure clean audio no matter the task due to its versatility. If you are an Arts students at the University of Nottingham and would like to borrow or learn more about the HDAP, or any of our equipment, please visit us in the Digital Humanities Centre in the Humanities building. Please note that the equipment is available for course related work only and you must show your student ID card. Inspiring Slides: John Frederick Lewis, ‘Indoor Gossip, Cairo’ by Fatima Kasujee.